"On the boxes were the initials "R.I.F." ( pure Jewish fat). These boxes were destined for the Waffen-SS. The wrapping paper revealed with complete cynical objectively, that the soap was manufactured from Jewish bodies. The civilized world may not believe the joy with which the Nazis and their women and the general government thought of this soap. In each piece of soap they saw a Jew who had been magically put there and had thus been prevented from growing into a second Freud, Erlich or Einstein." 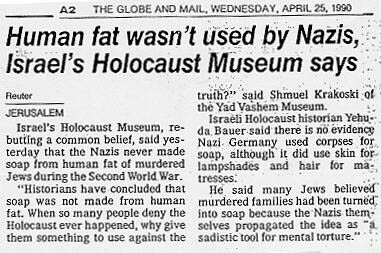 "the fact is, the Nazis never used the bodies of Jews, or for that matter, anyone else, for the production of soap. The soap rumor was prevalent both during and after the war. It may have had its origin in the cadaver factory atrocity story that came out of World War I. The soap rumor was thoroughly investigated after the war and proved to be untrue." "historians have concluded that soap was not made from human fat."